If you have ever tried to run Firefox Quantum and Firefox Nightly simultaneously on macOS, you’ve definitely noticed that, by default, it’s impossible. Firefox complains that only one instance of the program can be open at the same time, and then the application quits out of the second Firefox instance you tried to launch. The reasoning behind this is based on protecting user profiles. Profiles store the information about your browser instance. This contains information like extensions installed, themes uses, customization files and more. If you try to open two versions of Firefox with the same profile, Firefox will complain and quit. This is because two versions of Firefox can’t write to the same profile simultaneously without expecting to either corrupt the file or to record incorrect information. To protect profile data, the developer’s simply don’t allow it. 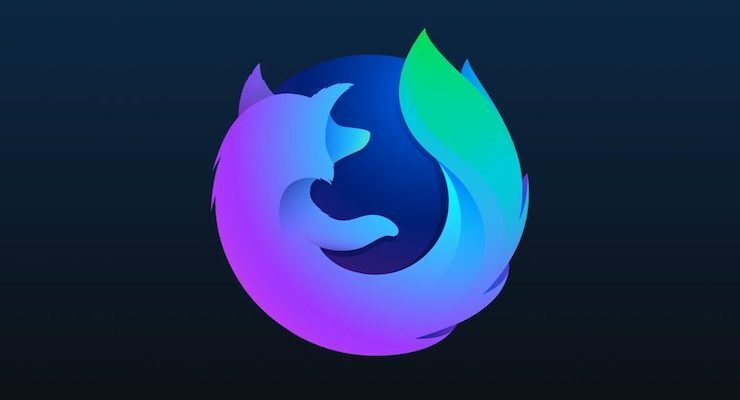 In order to run Firefox Quantum and Firefox Nightly simultaneously, we’ll need to create a new profile for use with Firefox Nightly. Then, the applications will both be able to open with separate profiles. 1. Close all instances of the Firefox browser. 2. Open Terminal (found in /Applications/Utilities/Terminal.app). Copy and paste the following command into the Terminal window, then press Enter to execute. This will launch the Firefox Profile Manager. It allows you to select, create, and modify Firefox profiles. Profiles are used to keep track of user information. 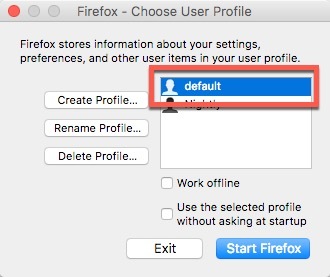 By creating a new profile, you create a “blank slate,” returning all user settings to their defaults when running Firefox under that profile. Creating a new profile will not disrupt or damage your primary profile. 3. Create a new profile by clicking the “Create Profile …” button at the left of the window. This will open a splash window describing what a profile is. Click “Next” on that window. 4. In the resulting window you’ll have the opportunity to name your new profile. 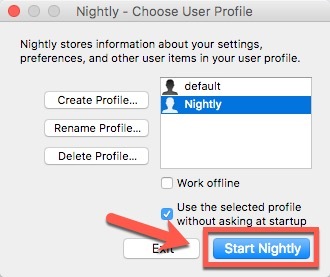 Name it “Nightly” to help you keep track of which profile is attached to which browser, then press the “Done” button to create the profile. By unchecking this option, you’ll be able to launch Firefox Nightly with the profile manager, allowing you to select your “Nightly” profile before starting the application and avoiding any conflicts. 1. Launch Firefox Nightly with the profile manager. Open Terminal again, paste the following command, and press Enter to execute. 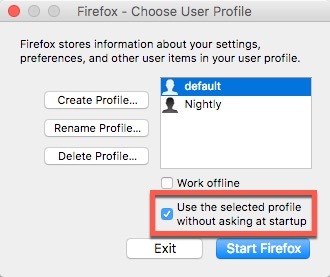 This will launch Firefox Nightly with the Profile Manager window, allowing you to select the “Nightly” profile before the browser launches fully. 2. 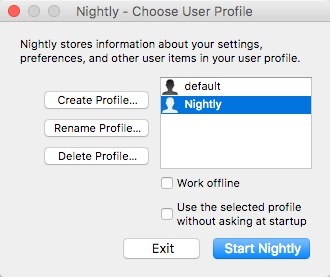 Select the “Nightly” profile from the list. This will allow you to launch Firefox Nightly normally (i.e. 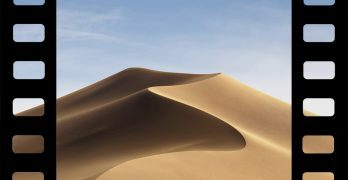 by double-clicking on the application or dock icon) and automatically load the “Nightly” Profile when doing so. 4. 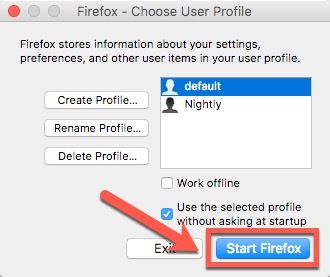 Click “Start Nightly” to open Firefox Nightly with the selected “Nightly” profile. 5. In the future, you can launch Firefox Nightly normally. It will automatically open with the correct profile. If you want to change the profile that Nightly opens with, run the Terminal command above again. We also need to open Firefox Quantum with the correct profile to avoid any conflicts. Repeat the above steps with Firefox Quantum. 1. Open Firefox Quantum with the profile manager. 2. 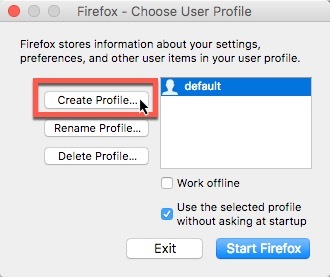 This will open the Firefox profile manager and allow you to select a profile. 3. Select the “default” profile from the list. 5. Click “Start Firefox” to launch Firefox Quantum with the “default” profile. As with Firefox Nightly, you can now launch Firefox Quantum normally. It will launch with the “default” profile automatically. If you’re a heavy user of Firefox Quantum, you likely have a good number of extensions and other settings on Firefox. 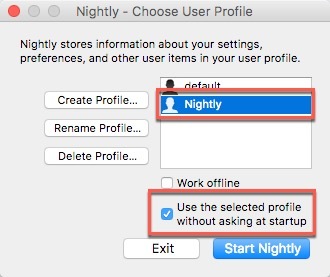 If you want to copy those settings to Nightly, you can do so by copying the correct files to the new profile folder. Make sure you do this while both versions of Firefox are closed for maximum safety. 1. Navigate to ~/Library/Application Support/Firefox/Profiles to see the profiles you have installed. You can either paste that file path in to the “Go To” menu option in Finder or navigate there manually. 3. 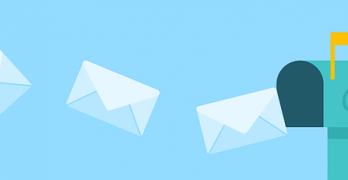 Copy the contents of the default profile folder to your nightly profile, overwriting any existing information. 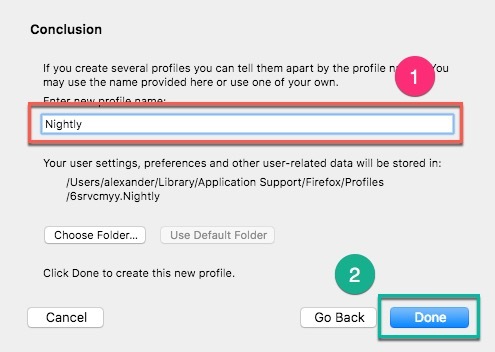 Now all your user data will appear in Firefox Nightly as well, though it will gradually diverge from your default profile in time. It is possible to run Firefox Quantum and Firefox Nightly simultaneously; it just requires a little bit of setup. Once you have that in place, you’ll be able to launch both apps normally without conflicting with one another.